Carve Me A Bear! 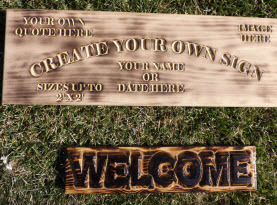 Chainsaw Carvings specializes in the carving of wood with a chainsaw. With Clark the Carver having over 30 years experience to hone and perfect his natural talents; these custom, unique creations make great birthday, anniversary, Christmas, wedding, house warming and anytime gifts for yourself or some special. Clark the Carver has been chainsaw carving statues, sculptures, signs and more a true passion that has brought smiles to many faces and has also won him numerous awards and accolades! 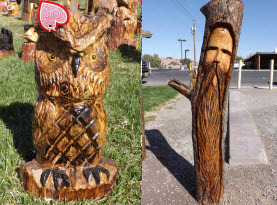 Wide Variety of Chainsaw Carved Animals & Much More! Clark the Carver of Carve Me A Bear! 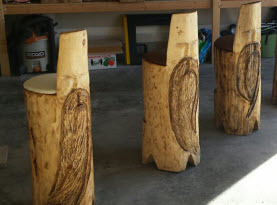 Chainsaw Carvings utilizes pine, redwood, ponderosa, cottonwood and other fine quality wood. 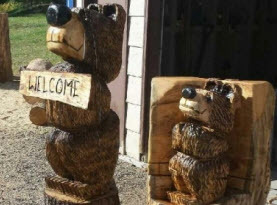 His work includes chainsaw carvings that include the following: Bears, Dogs, Raccoons, Birds, Horses, Moose, Owls, Coyote, Wolves, Bunnies, Squirrels, Lions, Chickens, Pigs, Eagles, Mascots, Garden Wizards, Mountain Men, Cowboys, Indians, Tiki’s/Totem Poles, Custom Furniture, Signs, Mantels, Flower Pots, Memorial Planters and so much more! Eagles fly higher than any other bird, in many cultures it is the symbol of power; chief over all other birds. People are often attracted to the majesty and grace the eagle offers. With the fierce nature and amazing capabilities, many folks have a special bond with eagles and collect an assortment of goods with the representation of the 60 various breeds of eagles found across the world. Just two species are residents of North America; the Bald Eagle and the Golden Eagle while two other species of eagles visit us on this continent; the Steller’s Sea Eagle and the White-tailed Eagle. How Far Can an Eagle See a Mouse? Do Eagles Fly Into Storms? Eagles have incredibly strong vision, they can easily focus on something such as a mouse or other prey for more than three miles away! Eagles will not scavenge on old kills, but will only consume freshly hunted animals. Eagles are excited and rejuvenated when storms roll in, where most other birds seek shelter until the storm passes. The eagle utilizes the strong winds in a storm to lift even higher into the sky than they generally go. They will ride the wind to lift above the clouds and glide through the storm. When eagles lay their eggs, they select a high place on a cliff where it is impossible for all manners of predators to reach their eggs. The males will build a barrier with thorns he has found and place them on the crevice of the cliff and then he collects the twigs and lays them out for construction of the nest which is called an eyrie. During the incubation period and until eagles are old enough to fend for themselves, the parents are very protective. One parent will always stay in close proximity to the eyrie. The Bald Eagle is America’s national bird and more than 25 countries depict an eagle in their flag. The bald eagle is so named due to its white colored head and dark color feathers on the rest of its body. If you or a loved one is in adoration with these respected chiefs of the sky, contact Carve Me A Bear! Chainsaw Carvings and see about one of our delightful carved eagles or get a custom eagle carving ordered today!